Enter for your chance to WIN 1 of 50 Pairs of Regular Adult Admission tickets to the 2019 National Home Show & Canada Blooms. The show takes place at The Enercare Centre in the Exhibition Place in Toronto from March 8-17 2019. The National Home Show, presented by RE/MAX and co-located with Canada Blooms, is the largest North American display of innovative products, new ideas and great deals for all things home and garden with over 800 retailers and industry experts. * No Purchase Necessary. 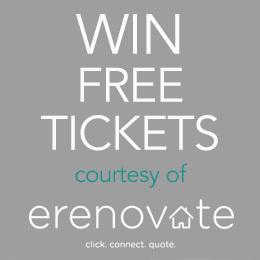 For full rules, visit www.eRenovate.com. Contest closes at 11:59:59 p.m. EST on March 4, 2019. Fifty (50) Ticket Prizes consisting of one (1) Pair of 2019 National Home Show & Canada Bloom Tickets, with an approximate retail value ("ARV") of $40.00 (CDN) will be chosen by random draw on March 5, 2019 at 10:00:01 a.m. (ET). Grand Prize has no cash value. Winning entries will be announced on http://www.erenovate.com/ on March 6, 2019. Odds of being selected depend on the total number of Eligible Entries received. Qualifying entrants must be a resident of Canada, excluding the province of Quebec, and be age of majority to win. Only one (1) Entry per email is permitted during the contest period. Looking to hire a contractor? eRenovate helps easily describe and post your project needs. Then, sit back as we match your project with Verified by eRenovate™ pros who are licensed, insured, reliable and government-registered. And, it’s 100% Free!